TfL, London First and Network Rail are starting to put together plans for Crossrail 2. This blog looks at the plans for South West London and an alternative, cheaper, plan - Crossrail SSW. Update 2015-11-30: This scheme has now been superceded by Crossrail 2 Swirl, which takes the same idea as outlined here and updates it to 2015. Most of the analysis below remains valid, as does the connected Mole Valley Link proposal. The base set of proposals to compare against come from London First (it appears that TfL are taking the lead behind the scenes). In Central London, the route runs from Euston/St.Pancras/Kings Cross (HS2 and other routes to the North) to Tottenham Court Road (Crossrail 1) to Victoria. This section is relatively uncontroversial. In South West London, the Crossrail 2 (CR2) plan routes from Victoria to a new stop in Chelsea, then Clapham Junction, Tooting Broadway (Northern line), Wimbledon before surfacing from tunnel. It then takes over services to Epsom, Chessington, Shepperton, Twickenham and Hampton Court. The key question is whether this route works for Soth West London? Sadly, there isn't any real detail behind the route maps, so there are more questions than answers. The biggest question is how will Earlsfield be served? Earlsfield is the station between Wimbledon and Clapham Junction on the South West Main Line (SWML), and is served by the services the plans absorb into CR2. But if those services aren't stopping there, what will? The services remaining on the SWML will be longer distance ones, to Portsmouth and Southampton, and mid-distance ones, semi-fast to Woking and Guildford via Claygate. The semi-fasts currently stop at Earlsfield, but their 4tph (trains per hour) service would be insufficient for Earlsfield's needs (any less than 12tph would not work). The next biggest question is how many additional fast paths are added? This is important, because the real problem on the SWML is in long-distance services, not the short-distance ones planned to be absorbed by CR2. Network Rail state that the short-distance services could be extended from 8-car trains to 12-car trains and run more frequently to handle overcrowding. By contrast, the long-distance services are already at the maximum number of trains per hour and train length, leaving no options for growth. The CR2 plans appear to suggest a fifth track between New Malden and Wimbledon, allowing an additional 9tph, or an extra 19% capacity. But this is of dubious value. Squeezing in an additional track (or more sensibly two tracks) is a major task for a working railway, and anyway some of the additional fast trains are going to have to stop at Earlsfield. In addition, it still means that the SWML is operating at absolute maximum capacity with no space for recovery, resulting in unreliable journeys and a general lack of resilience. This is a proposal to rearrange the proposals in South West London, providing more capacity for long-distance services, where it is needed and more effective use of existing assets, and all for a lower total cost. Currently, there are 2 tracks for the inner suburban services and 2 tracks shared between the outer and long-distance services. It is this sharing that causes many of the delays and problems on the SWML. The first part is a new express tunnel from Esher to just east of Clapham Junction. This tunnel would have no stations and be for the use of the long-distance services. As a new, dedicated 2 track tunnel, it would be built to modern standards and be capable of having trains running at 100mph or more, unlike the current SWML which is restricted to 75mph on the fast tracks through London. As such, journey times would be slightly shorter for the long-distance services, perhaps 5 minutes shorter for long-distance services. The second part is a core London tunnel, similar to CR2, starting from the Clapham Junction area. Since all the long-distance services have been removed from the SWML from Surbiton inwards, the existing 4 tracks between Clapham and Surbiton can be used without conflicts. The outer suburban trains would run on the old SWML fast lines, with the inner suburban services remaining on the slow lines as now. One key problem any Crossrail 2 type proposal faces is that it will change existing commutes, something which frequently causes a backlash. There are no signs that the official proposal is addressing this. The SSW proposal has a ready-made solution for this. The inner suburban services on the slow lines and the outer suburban services on the fast lines would both stop at Wimbledon, where it is a cross-platform change. Thus, Epsom to Waterloo would still be possible via an easy cross-platform change at Wimbledon. 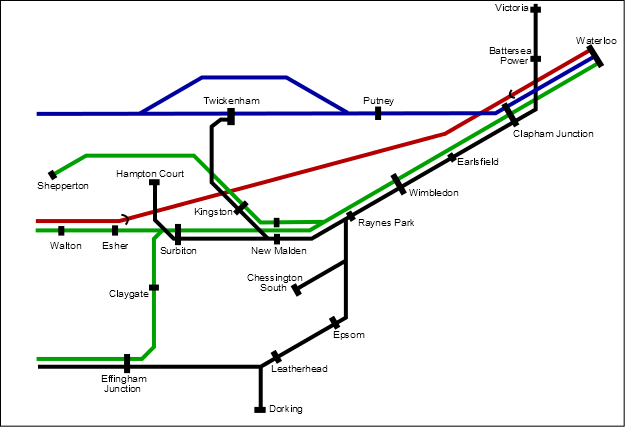 Similarly, Claygate to Victoria would be possible using the same cross-platform change, in the opposite direction. The tunnel portal for the core London section is the other crucial element in the SSW plan. The Clapham Junction area has vast amounts of railway land and existing tracks. One of these runs from Clapham Junction station down to Longhedge junctions and the site of the new Battersea Northern line extension station. A new interchange station would be built there, providing access to the vast new Nine Elms development, and a secondary route into Waterloo via Northern line (resilience). The CR2 inner suburban routes are in black, the outer suburban routes are in green, and the long-distance in red, going through the new tunnel. In order to balance the frequencies, the Shepperton service is allocated to be outer suburban, swapping between the fast and slow lines at New Malden. This gives Kingston services to both Waterloo and Victoria. The CR2 services to Dorking and Effingham Junction are unfortunate (Epsom or Leatherhead would be a better terminus), but cannot be avoided without an additional project (not discussed here). The long-distance services are not explicitly modelled here, however they would cover all existing services that run fast from Waterloo to Woking or beyond. Given that the current timetable is very constrained by lack of available paths, the long-distance services would likely be completely reworked, with up to 24tph available. The main downside of SSW against TfL is that it does not serve Tooting Broadway, and thus has a far smaller effect on the Northern line. In effect, the SSW proposal reduces benefits to those along the Northern line, and increases benefits to everyone along the SWML beyond Surbiton, as far as Portsmouth, Southampton, Bournemouth and Exeter. This seems like a good trade off, especially given the lower cost. However, given TfL's focus on London, they are unlikely to agree with the trade off. The Tfl plan for Crossrail 2 in South West London still lacks details and is thus hard to criticise in depth. However, the intended route is known and the ability of that route to relief the long-distance services (where the real capacity crunch is) can definitely be questioned. The Crossrail SSW (Surrey and South West London) proposal combines two parts, an express tunnel and a shorter Crossrail 2 tunnel, to produce a scheme that provides far more available train paths at lower cost. If you have any views on the two proposals - TfL vs SSW - then why not leave a comment! Update 2013-03-24: The Mole Valley Link is a related proposal that makes full use of the extra capacity of Crossrail SSW to enhance Dorking services and relieve East Croydon. interesting ideas - do you ever present them to "important" people? Is a Crossrail 2 connection with the Northern Line (Tooting Broadway or Balham) going to relieve the latter or make things worse?. There are just 3 Northern Line stations on the Country Side of Tooting Broadway while there will be 25 stations on Crossrail 2. Those commuters who reach Bank via the Waterloo and City Line will probably swap onto the Northern Line instead. CR2 will be 30tph, The Northern line will be 30tph. So, the frequencies at Balham or Tooting match. But each CR2 train can carry perhaps 2.5 time the people on each Northern line train. As such, there have to be 2.5 times more people transferring from Northern to CR2 than from CR2 to Northern for the Northern line to see any relief. As you say, for jobs south of Bank, in London Bridge or Borough will all be faster changing off CR2 and onto the Northern. Also I would definitely provide Clapham Junction platforms on the Express Lines in a box sunk into the yard between the Windsor and Main Lines, with the aim of stopping all long distance trains there for the exceptional connectivity available. Yard capacity would be sacrificed clearly, but some berthing might be relocated to Wimbledon and with the new tunnels that would create less conflict with longer distance trains than now. There is some industrial land to the north of Wimbledon depot that looks like it may have once been sidings and might be reacquired for railway use if necessary. Having spent a while thinking about it before publishing, my view is that the Sutton loop would always struggle to generate enough trade to justify linking in. I suspect it would also not draw enough people away from the Northern (which would be key). I did consider a combined express tunnel to Twickenham as well as Esher, but felt that there was enough demand on the main line. I wouldn't put platforms at CJ, partly because of cost, and partly because I think most express passengers just want to get to London. There would be links from Woking, Guildford, Farnham and Basingstoke on the old SWML fasts to CJ, also stopping at Surbiton and Wimbledon, so passengers would have enough options to get to CJ. I think part of the reason Sutton loop stations have failed to attract significant passenger numbers is the long journey time into central London. Interchange at Sutton or Wimbledon is preferable for some, but the majority of local residents would probably rather take the bus to Morden and join the Northern Line. CJ has always been a 'superhub' and the majority of off-peak expresses stop on the fast lines all day now, including SWTs longest distance services to and from Exeter. It is claimed the enhanced peak frequency can't be accomodated within the limited platform capacity available and this is why CJ stops are withdrawn in the rush hours, rather than any desire to speed up journey times. Your proposal would inconvenience all those currently interchanging at CJ. Additional changes at either Woking or even into Waterloo and back out again could add maybe 30 minutes or more to such typical journey times. The CJ question is a question of whether trains should stop (as per Stratford in the east) or not (as per Finsbury Park on Cambridge/Peterborough fasts in the north). Sure its a useful interchange, but it isn't much of a destination in its own right (whereas Stratford is). I'm happy for the numbers to show a CJ station is needed, but given the £400-£500m potential cost, not stopping must certainly be considered. Generally I think this plan for the southern end of CR2 is better. I do have 2 thoughts though. I'd curtail the Effingham Jct branch to there and give Shepperton to the inner suburban network. I'd do this to enable full physical separation between the 2 networks to avoid service pollution. Curtailing the service to Effingham would be possible, although I doubt service pollution is too much of a problem between there are Guildford, and the link is a useful one given the importance of Guildford. The Shepperton branch and Hampton Court branches could be swapped to achieve separation there. It would mean no direct service from Raynes Park to Surbiton however. I think you're right that a service on the inner network to Hampton Court is necessary. I would say split the proposed 8tph to Twickenham between there and Shepperton. Only Strawberry Hill to London and Twickenham to Kingston journeys would be sacrificed and they would still be at the frequencies of today, but still with the extra 2 cars of capacity and extra reliability. ...or even better the 12tph you propose (or more) to Kingston split between Twickenham and Shepperton, as I accept that Kingston could do with more than 8tph into London. I very vaguely remember seeing somewhere that 32tph was a theoretical limit they were working to on the Thameslink project- and that has flat junctions and service pollution all over the place. I do like the ideas here (especially the identification of the three different flows), but think that a mix of the London First and Crossrail SSW might work best in SW London - I have no idea about the finances, however! As you suggest, the long distance services in the London direction would go into a tunnel just after Esher, but they should emerge just after Wimbledon, then resuming the fast tracks into Waterloo. The connection opportunities at Clapham Junction would then be maintained. This would allow all four tracks from Surbiton towards London to absorb enhanced services from the Guildford/viaWoking (4tph), other fasts viaWoking (4tph), Guildford/viaCobham (4tph), and Hampton Court (4tph) lines @ Surbiton, then the Kingston trains (12 tph) @ New Malden, and then the Epsom (8tph) & Chessington (4tph) lines @ Raynes Park. Using the current fast & slow lines, this would allow cross platform interchanges at Wimbledon (no need for an expensive deep level station). Alternate trains would then proceed to Waterloo via the existing route or in the new Crossrail2 tunnel via Tooting/CLJ/Victoria etc, so Earlsfield would enjoy a 20tph service (every 3 minutes), the same as the Crossrail 2 line. There will be issues with level crossings between Raynes Park & Motspur Park, and New Malden & Norbiton to resolve, but this would appear to double the suburban services and introduce flexibility with Waterloo & Crossrail destinations with cross platform interchange at Wimbledon. Plus, with no fast trains through Wimbledon, there is less scope for fatalities, which all too often severely impact on services! I live close to Wimbledon, so see that the cross-platform interchange and lack of fast non-stoppers would be a big plus. I fear that things won't be completed until well after I cease to be a commuter, though! Most long-distance services don't stop at Clapham Junction today, and thats thought of as a feature, not a negative, by many. With SSW, there would be more mid-distance services stopping at Clapham Junction, such as Farnham, Basingstoke or Guildford via Woking services. Trying to put the long-distance services through Clapham Junction is part of the problem, because there aren't enough platforms to make it work (the fast lines would need 4 good platforms, and they only have 2 good ones and 1 poor one. You also suggest splitting the services from each destination 50/50 at Wimbledon to Victoria and Waterloo. To me, and I believe TfL, this is a major problem because it (a) halves the frequency of perceived service, (b) greatly reduces the ability to recover from problems and (c) makes the network much more complex. Basically, it would replicate the poor design of the Southern and South Eastern networks. I do note the fatality point, which I chose not to put in the main article, even though I suspect it could (sadly) be advantageous to the business case. In your proposals you say "The main downside of SSW against TfL is that it does not serve Tooting Broadway, and thus has a far smaller effect on the Northern line". If the Northern line was extended from Battersea to Clapham Junction and then on to Tooting Broadway where it could run to Morden the Northern would then be four tracked from Tooting to Kennington. The branch via Clapham whilst being long should be quicker as there would be less stops and the track would be to the latest standards. It is possible that this may work. However, I'm not sure that going via Clapham Junction makes sense. With SSW, there would be a 24tph service from Clapham Junction to Battersea Power, so that "link" isn't one that needs to be made, especially as traffic from Clapham Junction has the potential to be large. So, if the Northern line were to be used to relieve the Northern line(!) then I would take it from Battersea Power via "Mid Clapham" (1 or 2 stops) and Wandsworth Common to Tooting Broadway. I would be concerned about overloading the line however. Passengers from Morden to the West End would change at Battersea Power. would i be right in thinking that it would cost roughly £300m to provide a new deep station at Kingston on the new relief tunnel line? In the context of the overall CR2 scheme, that doesn't strike me as a huge amount to link a major shopping centre like Kingston to it's Surrey hinterland, eg Esher, Woking, etc. Well, not if the effective spend on the Tooting link is, as you say over £1Billion. For reference, Kingston's catchment area spills way into deepest Surrey, as can be seen in Plan 5 "RETAIL CATCHMENT AREA FOR KINGSTON TOWN CENTRE" at Page 46 in planning doc at http://www.kingston.gov.uk/adopted_aap_july08.pdf (big download). What would the logistical knock-on effects be to your plan? I considered a station at Kingston for a long time before dismissing it. The up-sides are good, as it would really benefit from the extra connections to the Surrey hinterland. The problem is constructing any kind of timetable that makes sense. Either you stop all long-distance services there, or you only stop some. Stopping all doesn't eat up paths, but does slow services down for a limited market from Southampton/Portsmouth. Stopping some messes up the pathing considerably. There would also be a good case for local services from Walton/Weybridge, which would eat up the paths. Another problem would be Kingston to London commuting dominating the capacity of the long-distance services (you almost want to ban Kingston to London via that route). The price is linked to this complexity. Stopping everything would really require 4 platforms (as long-distance services only have small doors) so the services can arrive and depart separately. If only stopping some services, 2 platforms might do, but you'd need a passing loop. In either case, £300m wouldn't be enough. All in all, while a great link, it just seems impractical in reality. One option would be a separate link from Surbiton (which gets much enhanced services with SSW). Potentially, replace the Hampton Court branch with a DLR or Tram type system, running Hampton Court (or Molesey proper) to Kingston via Surbiton, and plenty of potential for extensions. This would seem to provide a more balanced approach to the areas needs. I guessed your reply would be along those lines. A pity for Kingston, but I suppose they've only themselves to blame for not letting the mainline go through the town centre 150 years ago. I suppose it should be pointed out that under CR2, Kingston does get one additonal new link, to Tooting. That would be of some benefit to Kingston. Re converting the Hampton Court branch to tram - I've long thought the same thing, but the problems arise once you hit Surbiton. There's no natural uncongested route from Surbiton to Kingston. The closest low impact route to Kingsotn lies from Tolworth to Berrylands, roughly parallel to the Hogsmill River and onward past into Kingston town centre, but that's not close enough. Routing a tram through Kingston centre will always be difficult, although, once throgh it, it's an easy enough route north to Richmond via the fringes of Richmond Park. Just a couple of points! First is a small little error: services to Farnham don't terminate there - Farnham is a fully through station with all trains continuing on and terminating at Alton. Secondly, as a regular Into-London traveller on the SWML, I would disagree with your CJ assumption. Many people get off at CJ to change for Victoria or other destinations. The only reason many trains skip CJ during the peak period is due to capacity reasons on the inbound lines. I used Farnham as its the best known place on the branch (and some trains do at least start from there in the morning). CJ can still be considered as a stop, but at £400-£500m its an expensive addition. Most Whitehall offices can be walked from Waterloo as fast as from Victoria, and there are more tubes at Waterloo to the West End. So, its primarily links to West London, South London and the South Coast that are inconvenienced. Could the Northern line be relieved in this scenario by building a new Northern line station at Wimbledon with a reverse between South Wimbledon and Morden? Passengers would still use the Northern stations but take a down train to change at Wimbledon onto a CR2 or Wim-CJ-Wat service, making better use of the infrastructure at that end of the line. An interesting idea, but it would inconvenience anyone at Morden (or those arriving by bus at Morden) who want to travel to the City. And the link to Morden already effectively exists as the tram. I plan to write up my choice of Northern line relief soon. Great idea for the SW end of CR2, but CR2, is about resolving congestion in C London, at Victoria and KingX, as well as the N line. Personally I see the need to put all the long distant lines in tunnels to increase there capacity as well as allow other services to be increased. I therefore believe that CR2 should be built. then in order to be decided, extend CR2 to Clapham Junction (CJ). extend northern line from Battersea to CJ. put the M lines into tunnels and provide at least Double if not squad capacity of existing lines. construct boxes for CJ to double its platforms to allow increase in lines. Run the Richmond line under ground and convert the existing line into a tram line. This will allow the development of a H'throw line as well as speeding up thee connection to reading ( another hub station and growing city. connect Putney raul & tube station together. Make the train on the Kingston line run shorter carriages so they can run faster around the tight bends. in the main lets have a 30 year plan to improve the network. Instead of building the Esher - CJ tunnel, the express regional services could be diverted at Byfleet Junction to run via Addlestone, Chertsey & Egham before using a new short tunnel to connect with the (currently closed) Staines & West Drayton line. They could then connect to the GWML relief lines and onto Crossrail. This is (basically) one of the lines proposed by John Prideaux / Michael Schabus as part of Superlink, albeit with the lines extended to Portsmouth, Southampton and (once electrified) Exeter. Looking at TfL's distribution analysis, passengers typically travel on from Waterloo to the West End, Holborn or the City - i.e. all destinations served by Crossrail. New Crossrail lines should focus on linking up regional services. Instead of the Superlink" and current Thameslink idea of cramming many regional services onto a couple of lines, a number of dedicated new lines are required. Just to note that running via Chertsey, Egham and Staines would be very slow, to the point that it would be unappealing. Also, the GWML lines are going to be full (every main line into London is basically full). 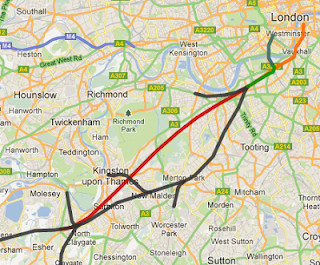 See also my Swanlink proposal for Waterloo to Liverpool Street. Personally, I think the Crossrail concept is most effective if it can distribute outer suburban and long distance commuters to a station close enough to their job that they can walk, thus leaving the tube for those in zone 1 to 3. Agree on your key point which is to separate the “inner-London tunnel” from the “Kingston & Wimbledon bypass”. The current Crossrail2 (regional) proposal confuses these 2 issues. The requirement should be to outline all options & analyse them before making a decision. To gain more capacity on the GWML, the LU Central line could be extended from Ealing Broadway to West Drayton (for Heathrow). Regional services would only stop at Paddington, Ealing Broadway & West Drayton with all local stations transferred to LU. The ex-GW trackbed is generally quite wide apart from the section over the River Brent at Hanwell, and the extension to 6 tracks with unused platforms removed at the local stations would probably not be too difficult. Although speeds are slow through the junction, Byfleet Junction to Chertsey has a line speed of 70mph vs. 90mph for the main line (which reduces towards London). Rather than sending services through Chertsey & Virginia Water, a new fast line (of approx 4 miles from Chertsey – Staines, mostly above ground next to the M25) could be built. This may be more cost effective than the roughly 10 miles of tunnel from Esher to CJ. Agree on your last point, although my current thinking is that it should be outer suburban (roughly 8-20 miles out) and regional (roughly 20 - 75 miles out) that are connected via Crossrail tunnels. The key is to have a long term plan to link up all of the regional lines via a set of short tunnels with services running through London rather than terminating at the ring of terminus stations. To keep costs down, very few intermediate stations should be built, although multiple entrances should be used to aid passenger flow. Swanlink is a very good solution to the problem of Crossrail’s Stepney junction being far too close to the centre of London and connects regional lines without excessive cost via tunnelling. I hope your proposal is to choose one of the 3 intermediate stations rather than build all 3 ! The long distance lines (GWML, WCML, ECML, HS1) should be connected to each other but kept separate from the regional Crossrail tunnels. I think it’s fine to run LU/LO to zone 5/6, but the lines must connect with the regional railway in roughly zone 2/3 and again in zone 5/6. A good example, are the ex-LNWR lines out of Euston, where the metro (DC lines) are next to the regional (slow lines) and the inter-city (fast) lines. Inner-suburban slow lines (south of the river) could be transferred to LU/LO once the regional Crossrail tunnels are built. any chance of sharing your Crossrail 2 submission? I'd be interested in sharing your views around Kingston. The local paper, Kingston Guardian / Surrey Comet is showing an interest, and are likely to cover it in more detail come September when TfL hopefully provide more detail to the London Assembly Transport Committee on the disruption to long established cimmuting patterns in SW London. I definitely will be logging more. My views in SW London remain along the lines of the SSW scheme, as it is the only one to provide cross-platform change for existing Waterloo passengers. Thanks for sharing Interesting ideas with us.